an efficiency rating expressed as a percentage, based on a federal government test procedure. The test includes combustion efficiency, flue loss, and flue loss in the burner off cycle. The data is calculated to simulate a complete heating season of operation. AFUE measurements are calculated for residential boilers only. a generic name for a device consisting of a blower and a finned-tube coil. It is used to either heat or cool the air passing through it based on the temperature of the fluid circulating through the tubes of the coil. a term often used to describe gas burners that are designed to operate directly exposed to (unpressurized) room air. an insulated, water-filled storage tank that forms a link between a heat source and its related hydronic distribution system. A buffer tank is often used to reduce the inefficiencies of short-cycling when low-mass boilers need to operate under low load conditions. a term used to describe a boiler control feature that allows multiple boilers to be linked and sequenced to function together. Cascading systems allow for increased turndown ratios and built-in redundancy in case of boiler failure. a piping system that is sealed at all points from the atmosphere. the efficiency of a heat source in converting the chemical energy content of its fuel into usable heat. This efficiency is based on the percentage of heat lost up the flue and is calculated using measurements of exhaust gas temperature and carbon dioxide content. the liquid formed as a gas, such as water vapor, condenses. operating a combustion-type heat source so that the water vapor produced during combustion condenses on the internal surfaces of the heat exchanger. Continuous flow rating: the rate at which a water heating device can supply heated water at a given temperature on a sustained basis, often expressed in gallons per hour or gallons per minute. a difference in temperature. Often used to express the difference between supply and return water temperatures or indoor and outdoor temperatures. The term is used in heat loss and efficiency calculations. heated water used for purposes of washing, cooking, bathing, etc. DHW is considered suitable for human consumption. 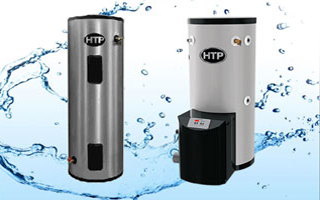 a water heater that contains its own heating element or burner. a type of active solar energy system in which freezing and over-heating are avoided by having all fluid drain out of the collectors and exposed piping into a holding tank at the end of each operating cycle. Expansion tank: a tank specifically designed and sized to accommodate the increased volume of system fluid that exists when that fluid is heated. 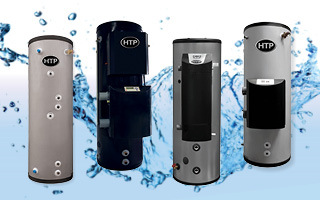 the volume of Domestic Hot Water that a given water heater can deliver within the first hour of a draw. It is based on a specified hot water supply temperature and rate of heat input. a device that converts solar radiation to heat using a flat, fluid-cooled plate in an insulated and glazed housing. a device that transfers heat from one fluid to another without allowing the two fluids to make physical contact. a term coined to describe a heating or cooling system that transfers heat by circulating a fluid, such as water, through a closed system of pipes. an insulated storage tank that contains an internal heat exchanger. Hot boiler water is circulated through one side of the heat exchanger, transferring heat to domestic water on the other side. heat that is added or removed from a substance without any temperature change. This occurs as a material changes phase from solid to liquid, or from liquid to vapor. the heating requirement necessary to maintain a desired temperature in a building, room, or a volume of material such as a tank of water. 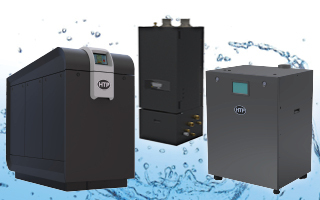 a boiler that operates with a small volume of water, sometimes as little as a few quarts. The low-mass concept reduces standby losses associated with boilers during off cycles and provides nearly instant heating with relatively low fuel consumption. a flammable mixture of hydrocarbon gases used as fuel in heating appliances. Varieties of LP gas include mixes that are primarily propane, mixes that are primarily butane, and the more common mixes including both propane and butane. a safety control that turns off the burner of a heat source in the event of low water, preventing pressure vessel failure. a term used to describe modulating condensing hydronic appliances. a process by which the rate of energy flow is continuously adjusted as necessary to match a varying load. Common examples include modulating valves and modulating boilers. an operation controller capable of independently operating two or more boilers as required by the load. a generic term for mono-nitrogen oxide chemical compounds. They are produced during combustion, especially at high temperatures. NOx compounds are a factor in air pollution and are harmful to human health. 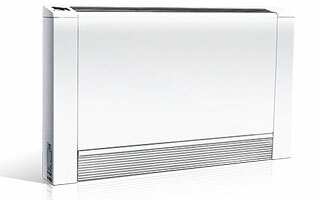 a control action or device that automatically changes the upper temperature limit of a hydronic system based on outdoor temperature in order to improve efficiency and enhance comfort. a control response where the value of the output signal is based on the error between the target value and the actual (measured) value of the controlled variable, as well as how long that error has existed. water that is suitable for drinking. Potable water is free from contaminants, harmful organisms and impurities. a main distribution circuit tied to the system’s heat source and supplying several secondary distribution circuits. a term often used to describe space heating by means of radiators, under-floor heating loops, or baseboard heaters, not by forced hot air. 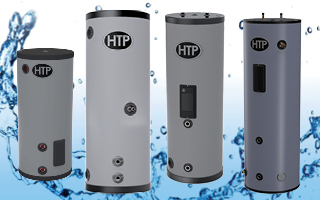 a version of a water heater that produces and maintains a higher than usual water temperature. Sanitizers are often used for sterilizing and disinfecting purposes, such as restaurants’ dishwashing operations. a desired temperature that is to be maintained if possible and is set on a controller, such as a thermostat. an undesirable condition during which the burner of a boiler operates for a very short time. It leads to a high number of on/off cycles and premature wear of components. Short-cycling often occurs when a boiler is excessively oversized or connected to a highly zoned distribution system. a measurement of heat lost from the surface of a water storage vessel while the vessel’s heat source is off. Standby loss is often expressed as a percentage lost per hour or a number of degrees lost per hour. a physical property of a material that indicates how fast heat can move through the material by conduction. The higher the thermal conductivity, the faster heat can move through the material. 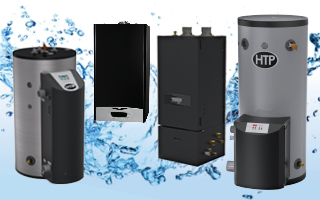 a measurement of efficiency which determines the exact amount of heat transferred into the water during the operation of a water heater or boiler. Thermal efficiency is expressed as the percentage of available heat from the burner which is transferred into the water. the ability of a material or object to store heat due to its mass. the length of straight pipe which yields the same pressure drop as the sum of all piping, fittings, valves, and other components in a piping circuit. the ratio of a burner’s capacity at full fire to its lowest firing point before shut-down. If a 1 million BTU boiler can fire as low as 100,000 BTUs, it has a 10 to 1 turndown ratio. Appliances that have a wider turndown ratio are typically more efficient at meeting variable loads. a device used to provide large volumes of Domestic Hot Water, typically for commercial applications such as restaurants, hotels, apartment buildings, etc. an area of a building for which space heating is controlled by a single thermostat.